Advanced Technologys AK47 Strikeforce Stock is a sixposition adjustable and sidefolding stock featuring the Scorpion Recoil System. 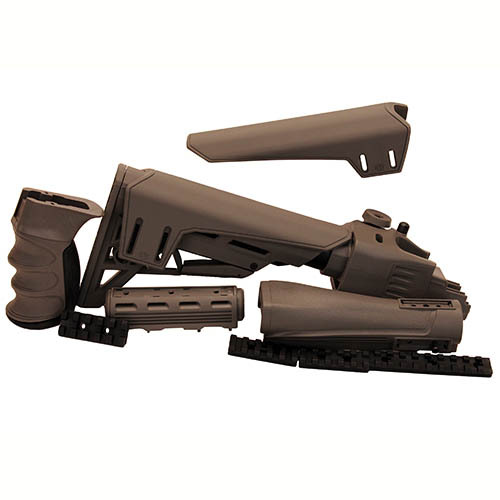 This stock features a TrakLOCK System which eliminates horizontal and vertical movement of the stock on the buffer tube provides smooth secure stock adjustments and eliminates the need for secondary locking mechanisms. It also includes the Scorpion Razorback Recoil Pad which is nonslip and removable an ergonomic suregrip texture Scorpion Recoil Pistol Grip one 4 picatinny rail two 2" picatinny rails one 2" picatinny rail with swivel stud a dualsided QD attachment point removableadjustable tallshort cheek rests a slot for tactical sling attachment three sling swivel studs and steel TNut and Bolt."